We present the idea of adversarial learning for one-dimensional signal denoising. 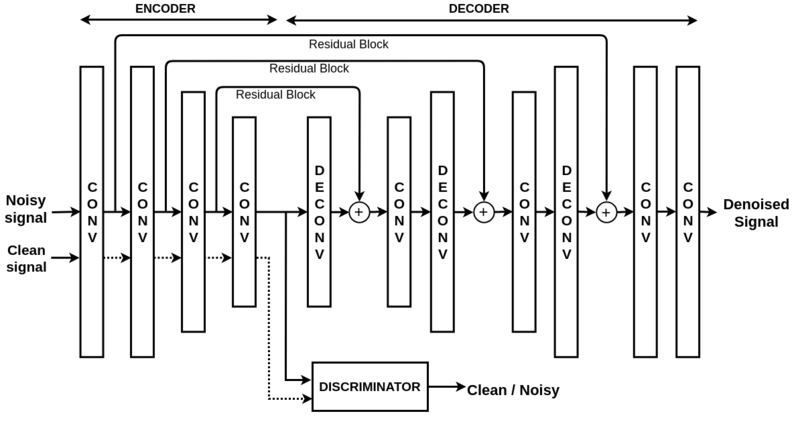 An adversarial encoder-decoder network is proposed for denoising signals, represented by a sequence of measurements. We rely on the network’s latent representation as input to the discriminator to classify the signal into clean or noisy. Aligning the noisy and clean signal distributions results in removing the signal noise. Unlike the standard GAN training, we propose a new formulation that suits to one-dimensional signal denoising. In the evaluation, we show better performance than the related approaches, such as autoencoders and recurrent neural networks, demonstrating the benefits of our adversarial encoder-decoder network in different signal and noise types. We continuously create new topics for student projects or bachelor- and master-theses. Feel free to contact me, if you are interested in one of the topics seen here.